Update (March 30, 2012) – Gov. Chris Gregoire signed pro knife legislation HB 2347 today! Congratulations to Mike Vellekamp for seeing this bill through the process to become law. The American Knife & Tool Institute will continue to work with Washington AKTI members to ensure their rights regarding knives. Update (March 1, 2012) – HB 2347 passed the Washington Senate 47-2. Passed bill. Update (February 9, 2012) – Washington State House bill 2347 passed with a vote of 94-0! 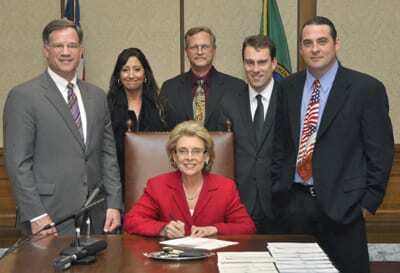 Olympia, WA (February 3, 2012) – Thanks to the foresight and efforts of Mike Vellekamp, Fox Knives USA, Washington state legislators are working with knife manufacturers to make effective changes to Washington knife law. Mr. Vellekamp garnered the support of his 25th District Senator Jim Kastama and Rep. Bruce Dammeier to introduce legislation that will benefit the state’s knife business, public safety personnel and individual knife owners. Senator Kastama reported to the Senate Judiciary Committee that SB 6179 corrects technicalities and would put Washington state in alignment with the Federal Switchblade Act. Before that committee on Jan. 25, Mike Vellekamp, co-owner of Fox Knives USA, Puyallup, stated “We want to make it so Washington State is friendly for manufacturing all types of cutlery products.” Passing the new Sec 2 to Chapter 9.41, will make it legal to manufacture switchblade knives in the state of Washington, subject to certain restrictions. AKTI Advisory Member, Spencer Frazer, founder of SOG Specialty Knives and Tools, Lynnwood, WA, testified at the House Judiciary Committee hearing the same day in support of the HB 2347. “The definition of switchblade needs to be clarified, and this bill does that,” he commented regarding changes to Sec. 1 RCW 9.41 that includes “A knife that contains a spring, detent, or other mechanism designed to create a bias toward closure of the blade and that requires physical exertion applied to the blade by hand, wrist or arm to overcome the bias toward closure to assist in opening the knife is not a spring blade knife.” (Note: Washington state uses the term spring blade knife for switchblade.) This is the same “bias toward closure” language that AKTI introduced and has been successfully passed in other states and incorporated in to the 2009 amendment to the Federal Switchblade Act. Clarifying the definition of switchblade (or spring blade knife) is important to protect the rights of the individual knife owner. It eliminates potential misinterpretation about the legality of one-handed, or assisted-opening, knives that can result in inconsistent and wrongful conviction of individuals for owning or carrying a knife that is a valuable and potentially life-saving tool. Both bills have passed the first committee of their respective legislative bodies without opposition. AKTI has sent letters of thank you to the sponsors and in support of the legislation. If you live or work in Washington state, do your part. Contact your Senator to ask for a yes vote on SB 1234 and your Representative to support HB 2347. Find your legislators at www.leg.wa.gov including links to email them. You can also track the progress of the bills on the website. “Navigating the legislature process is challenging, but not that difficult and certainly rewarding,” AKTI member Mike Vellekamp said, describing experience so far. “We will continue to push for passage and continue with the ultimate goal that all Washington state residents will be able to buy and own the knife of their choice.” Mike added thanks to the invaluable support of Spencer Frazer, Steve Avila of Blade-Tech, and also to Todd Rathner of Knife Rights.